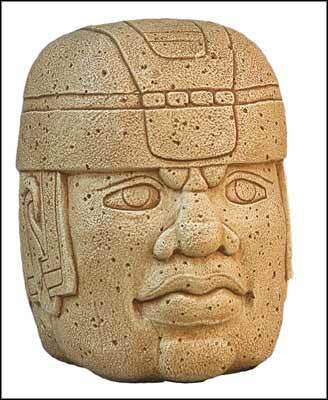 Olmec colossal heads, Olmec heads, Olmec Art, Olmec, precolumbian reproductions, mesoamerican reproductions. Few of the world's art treasures conceal more mysteries than the stone sculptures of the Olmecs, the Gulf Coast people who created Mesoamerica's first civilization more than 3000 years ago. The objects range from exquisite miniatures fashioned from jade and serpentine to colossal stone heads. One feature that distinguishes them from the art of later peoples is their stark realism, many of the sculptures are fashioned in the round, portraying the human figure in squat but accurate detail. Almost two meters high and weighing over 15 tons, this monumental head is one of four found at La Venta, near the Gulf Coast. Scholars speculate that they may have portrayed rulers of the city. The Olmecs wrought these colossal heads from huge boulders of basalt from the Tuxtla mountains, 100 km away and they must have floated them on balsa rafts along the slow-moving rivers of the Gulf Coast. At La Venta, the four colossal heads were set as if to guard the ceremonial core of the site, three to the south and one to the north, all with their backs to the architecture.